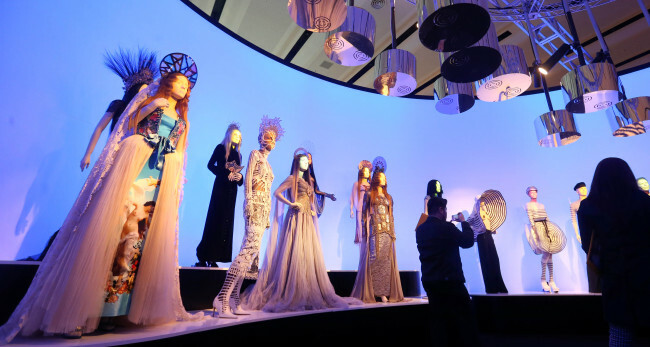 A touring exhibition dedicated to the creations of veteran French fashion designer Jean Paul Gaultier has made the final stop of its five-year world tour in Seoul. The exhibition, which opened Saturday at Dongdaemun Design Plaza, showcases more than 150 haute couture and ready-to-wear outfits that Gaultier designed between 1976 and 2016. Also on display are his sketches, stage costumes, footage from films, fashion shows and concerts related to his works. “After traveling the world for five years with this exhibition, it is a great to have the finale in Seoul, the only venue in Asia, at the fantastic DDP. 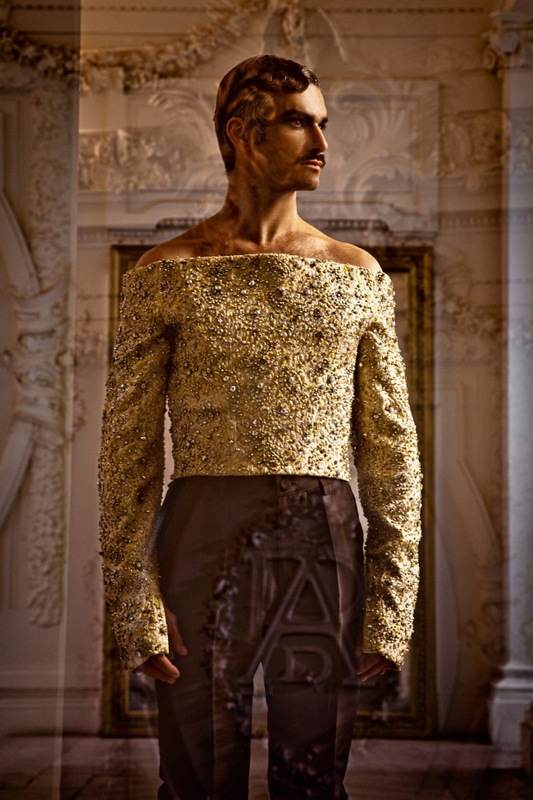 I could not have dreamt of a more beautiful place to present my creations to Asia,” Gaultier said in a press statement. On Friday, the fashion designer presented a special haute couture fashion show, his first in Seoul, to mark the opening of the exhibition, which is organized by Hyundai Card here as part of its Culture Project series. The exhibition, organized by the Montreal Museum of Fine Arts in collaboration with Maison Jean Paul Gaultier, Paris in 2011, has traveled to 11 cities, including Madrid, Stockholm, New York, London, and Paris, attracting some 2.2 million visitors over five years. The Seoul exhibition is its first showcase in Asia. Celebrating the fashion designer’s daring creations, the exhibition highlights his eclectic, impertinent sources of inspiration and ideas divided into eight sections. The name Gaultier is synonymous with singer Madonna and befittingly, Madonna’s stage costumes -- including the iconic conical corset worn during her Blonde Ambition tour in 1990 -- plus sketches of her costumes receive prominent attention in the first section of the exhibition, which also features corsets and core bras reinterpreted in contemporary fashion. With great irony, Gaultier successfully changed the perception of traditional female underwear, from oppressive garments associated with women’s inferior social status to a symbol of the strong modern women. Breton stripes, another key Gaultier signature, are explored in the Odyssey section of the show, tracing the inspiration behind the successful transformation of what was decreed the French navy seamen’s uniform in 1858 into a classic fashion item. Gaultier, hailed as an “enfant terrible” when he debuted in the Paris fashion world in the 1970s, has challenged the standard ideal of beauty in many of his collections and advertisement campaigns. He collaborated with singer Beth Ditto in launching the “corset tee” for oversized women and had Ditto open and close his spring-summer 2011 show. “The exhibition is not merely a fashion retrospective, but a poetic, contemporary installation that carries the strong social message we find in Gaultier’s work. It is an all-embracing art form that reflects his spirit in an opulent show,” said Nathalie Bondil, director and chief curator of the MMFA. The exhibition, featuring multimedia installations, also showcases Gaultier’s artistic partnerships with filmmakers, dancers, pop stars and artists, including Luc Besson, Regine Chopinot, Madonna, Andy Warhol, Peter Lindbergh and Cindy Sherman. Entrance fee costs 8,000 won for children and 15,000 won for adults. For more information, visit www.superseries.kr.